I meet Andrea James—playwright, director and Artistic Associate at Carriageworks—early evening at the end of rehearsal: the room is littered with props, the desk with scripts, design plans, empty cups and intriguing signs of traditional Aboriginal craft. It’s only a few weeks til bump-in and I’m wondering how James, who looks calm enough, is feeling about what she immediately describes as “a really big beastly new work.” Clearly, she’s still at work on the final shaping of the play. 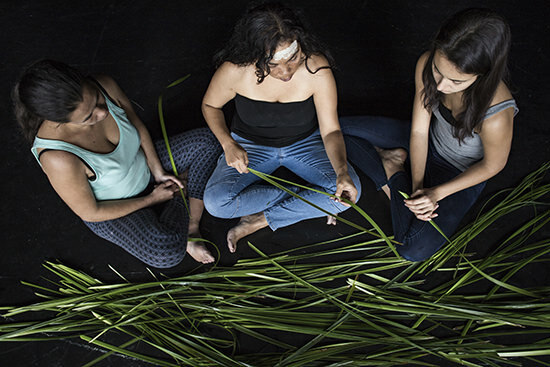 In Winyanboga Yurringa (Yorta Yorta for Women Under the Sun), six Aboriginal women gather at a campsite in Yorta Yorta country in regional Victoria, hoping to connect with the land. But the fun of being together and their bickering about identity, love and appearance get in the way of spiritual communion until an ancient cultural practice provides a way through. How long has Winyanboga Yurringa been brewing? It started with a commission from Belvoir for a large-scale stage adaptation of the four-part TV mini-series Women of the Sun (1981), co-written by Hyllus Maris and Sonia Borg. There were five writers in the team. Four were to adapt a story each, and my job was to write a new episode, asking ‘who is our Woman of the Sun today and what are her major concerns?’ So, I set about interviewing lots of women I knew. I was working at the Koori Heritage Trust at the time, doing community arts work. It was a really inspiring place actually because it’s one of the very few community-controlled, fully accredited museums and they had an incredible collection. Also, I was visiting the 38 Aboriginal nations of Victoria coordinating weaving workshops and [encouraging] the revitalisation of culture. This was around 2012-13 when we started it. The script was workshopped and pitched to the Major Festivals Initiative, but didn’t make it, so I had this little play in my back pocket. I put it in the drawer and didn’t really think about it. Then an opportunity came up to workshop it with Playwriting Australia. So I built it up from 20-30 minutes to a full-length work. It went to the National Play Festival in Perth in 2013 and, after that, I came back here and did another development. Has it retained its relationship to Women of the Sun? It’s influenced by that work in that Women of the Sun was the initial spark. The Belvoir project never came to fruition? No, unfortunately it didn’t. It was big and ambitious but it didn’t make it. But the impulse remained, to say something about Aboriginal women now? Definitely. The first port of call was just to have conversations with lots of women in Melbourne and also up in my Yorta Yorta country. Was the weaving initially a focus for the play? No, that was separate, but kind of fed into it. I was just really interested in watching our mob engage with cultural objects. Everywhere. The Koori Heritage Trust collection is fascinating. One of its founders was Jim Berg, an incredible man who was working in a department of the Australian Museum. He really struggled with Aboriginal artefacts being kept in an institution and how difficult it was for him to get a hold of them, even to exhibit them himself. Also, because he was working in the museum sector, people kept coming to him with important objects that they were finding on land, like stone-heads from axes and digging sticks. He was thinking that he didn’t want to put them in a museum. Jim Berg was one of the driving forces behind the Koori Heritage Trust plan to put cultural objects into the trust of the community, rather than in non-Aboriginal institutions. What they collect is really interesting: things we might think of as everyday objects—leatherwork stubby-holders and aunties’ woven rugs made in Koori colours—are included. These things have meaning for the community. Other people might think, ‘Oh yeah, it’s just a stubby-holder and a rug,’ but for us, we knew the people who who made them. So it’s a really important collection. How did the weaving workshops relate to the Trust collection? The women would come to the Trust and we’d go down into the Archives and show them the baskets that were made by the aunties who were no longer living. Oh, it will stick with me forever, the energy of that. But also as a theatre-maker, [I thought about] how interesting it would be to put those objects in a performance setting, and the weaving too. Here’s an incredible practice that’s been on this country for so, so long, that connects us to country. So, there’s now a place within the play which is just about weaving and the dance that relates to it. And the actors actually do it. [James shows me a small weaving]. I can show you. [She reaches behind to select a strand from a large bundle of long, inch-wide strips of grass.] We got this from La Perouse with permission from the mob there. Look at the colour of it! When you strip it, you can smell it but it also does something to your body. So, in performance this will be so beautiful. How did you go about selecting the objects which will feature in the production? It’s hard to talk about it without giving it away. 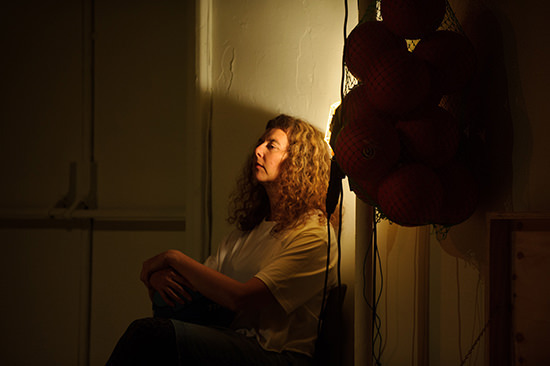 Part of me as a theatre-maker asks, “What if…?” So, what if all of the objects that are in this play are the ones that I saw as ‘trapped’ in a museum. As part of my research, I sought out all of the objects at the Australian Museum that were from my country and they let me take photographs. I’ve put them in the play. So I’ve asked, what if the women in the play stole those artefacts and brought them to country to repatriate them? Identity and repatriation and evolving cultural practice are some of the really strong themes in the work. That’s a case of taking a story and running with it. It’s a change from the dramatising of historical events which has been strong in Aboriginal playwriting. I thought, well, if you’re going to make a political statement well let’s push it to its nth degree. There’s often an assumption that we’ll just rock on to country and know what to do. Actually, sometimes you don’t know what to do. I was interested in that awkward place, that place of re-connection which can sometimes be difficult and painful. Things fall into place. What have you learned about the contemporary Aboriginal woman? Is that still central or has repatriation become more a focus? To be honest, I haven’t discovered anything that I didn’t already know. If anything it’s reaffirmed things. 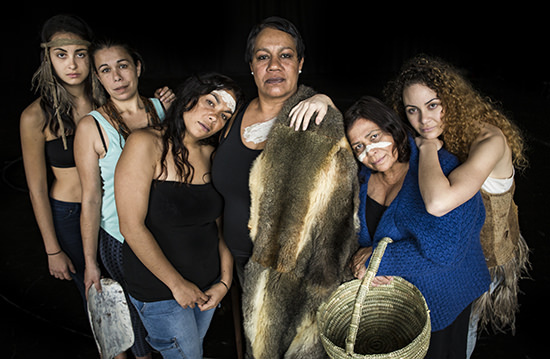 I was interested in just seeing six Aboriginal women on stage—something we haven’t seen for a long time. A lot of women I interviewed talked about lateral violence and what it means in our communities. Where community members turn on each other. It’s like internal violence, when we turn our struggle in on each other and where people get into positions of power. This affects both women and men, of course, but when I spoke to the women, there was a sense of a real struggle around that power and what people can sometimes do to try and cut you down for it. So this has become part of your scenario? It has. The last episode of Women of the Sun was about the Stolen Generation and how you bring yourself back into community. I think the community struggles with what to do with people who want to return. So, I’ve picked up on that theme. I’ve also used [photographic, video and installation artist] Bindi Cole’s story about people from the community questioning her Aboriginality and her work—that classic portrait of her family with black-painted faces—and how she was one of nine Aboriginal people who successfully sued Andrew Bolt for questioning their identities and breaching the Racial Discrimination Act. In the redrafting I didn’t want to give Bolt any more air, that’s done, but I was interested in what Bindi described, so her story comes into the play—the other women don’t know who she is and she has to kind of prove herself. What kind of theatrical structure have you developed for the play? Has it emerged from your investigations and speculations? It definitely has, from all the interviews I was doing. When I finished it I thought, ‘Oh I’ve written a naturalistic comedy. Where did that come from?’ But that’s just how the story wanted to be told. I’m in more of a magic realism sort of space, so it surprised me. You’ve written a heist comedy? Ha! It kind of is and there’s a lot of banter. It’s a comedy, which it sort of has to be. The biggest thing when you hang out with a group of women or you go out bush, it’s the laughter. That just poured out, given that they’re dealing with some really difficult issues like poverty and violence, difficult relationships with men. The massive thing that you just can’t ignore, particularly up around my home town, is drugs. It’s rife. You don’t want to fuel stereotypes but, at the same time, it’s such a force. How can we not think and talk about it? And in actual fact, women are so at the front line. Managing it or involved in it themselves? Both, and looking after the children who are the casualties. A lot of the removals of children that are taking place now are the result of drug and alcohol abuse. So it’s pretty big. I feel it as an aunty with a little niece who’s just turned 13. In the play, there’s a young girl who is at risk. The central character, Neecy, has brought everybody back on to country because they’re straying off the path and need to regroup and re-empower themselves, particularly for the character Chantelle, who is kind of based on my sister and my niece. We want to watch for her and hold her and make sure she’s going to be alright, because our teenagers are so vulnerable and they could go either way. Tell me about the design that contains these complex issues and feelings. I’ve got a beautiful designer, Danielle Hrome, who is studying at UTS. This will be her first big design for theatre. It’s really abstract: a big round campfire and forms that hang in space that could be trees, they could be shell middens. In my country, river country, on the River Murray, middens are really important. They could be spirits, they could be female energy—Bindi Cole has photographed the actors and their images will be embedded in the design. The idea is that people have come to this place for hundreds and hundreds and hundreds of years. It’s pretty simple really. Phil Downing is doing the soundscape for us and the AV, with Bindi. Karen Norris will do the lighting. As with the design, we’re trying to cut against the naturalism, which is why we wanted something more sculptural in the design. It’s a comfortable space for the audience too. We’re inviting you onto our land. Just come and sit with us for an hour and a half and we’ll share some stuff with you. Hopefully, through that you’ll come to understand your own relationship with this land and the people in it. If I can get to that, I’ll be very very pleased.